**I received an ARC of this book from Amazon Vine and the publisher for my honest review. BACK COVER SUMMARY: The last person Zac expects to meet in the hospital room next door is a girl like Mia--beautiful, angry, and feisty, with questionable taste in music. In the real world he could never be friends with a girl like her. But when a knock on the wall leads to a note, a friendship surprises them both. Does Mia need Zac? Does Zac need Mia? Maybe they both need each other, always. Told in alternating perspectives over nine months, Zac and Mia follows the relationship of two ordinary teenagers enduring extraordinary circumstances, in this tough and tender young adult novel that's a lot about love...and a little about cancer. OVERALL IMPRESSION: Something sucked me into this book the moment I started reading it. I didn't want to put it down and I ended up finishing it in less than 24 hours. At 304 pages, it's pretty short and the captivating writing makes it really easy to fly through.I really like the way the perspective was done with this story. 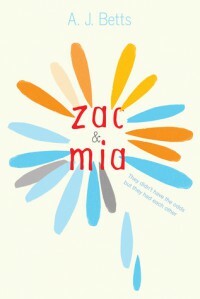 The first part of the story is told through Zac's perspective, the second part of the story is told through the alternating perspectives of both Zac and Mia, and the third part of the story is told through Mia's perspective. This made it so that I was able to get to know Zac, then see how the two characters worked together, and then finally get to know Mia more in depth. I was slightly disappointed in the ending. I wanted a more definitive ending that showed further into the future. I wanted to know exactly what happened to both Zac and Mia in terms of how their cancer was doing, as well as how the relationship between the two developed. CHARACTERS: I loved the character development throughout this story. I loved getting to know both Zac and Mia on an individual level as well as seeing their interactions together. I feel like I know a lot about them and how they feel and deal with situations. I also feel like there was a lot of character growth throughout the story. Also, Zac's mother was one of my favorite characters. I could really tell that she cared about her son a lot and would do anything for him. COVER: 3.5/5 The cover is nice. I like the simplicity of it.